We were ‘blown’ away by this eye-‘popping’ sculpture! Did you know, this year marks the 50th anniversary of the legendary TV series Thunderbirds? 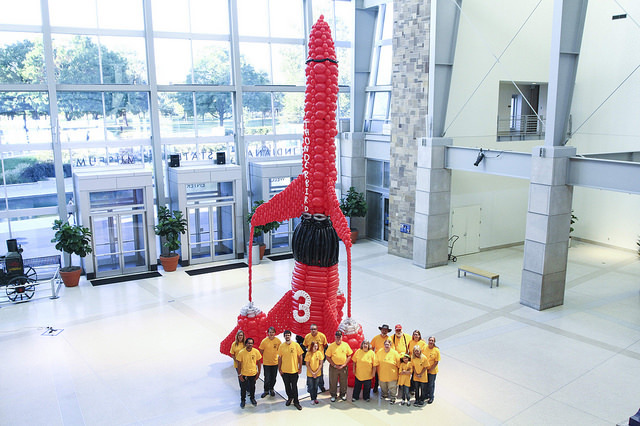 With a replica of the Thunderbird 3 rocket made from 2400 balloons! If that wasn’t impressive enough, the sculpture took 9 hours to make! It takes us half an hour just to blow up one! The rocket replica is 30 feet tall – about the same height as two double-decker buses! You can see the actual Thunderbird 3 in the re-made series Thunderbirds Are Go on ITV and CITV in 2015.